Chatham Colony Cluster in the Lake Anne area of Reston is a small, family friendly community. Chatham Colony Cluster is the kind of neighborhood where neighbors get together to watch ball games and children wander freely in and out of each other homes. If you wanted one word to describe this townhouse community in the Lake Anne area of Reston it would be "friendly." This is a small cluster of about 45 homes, each of which has a wooded backyard. 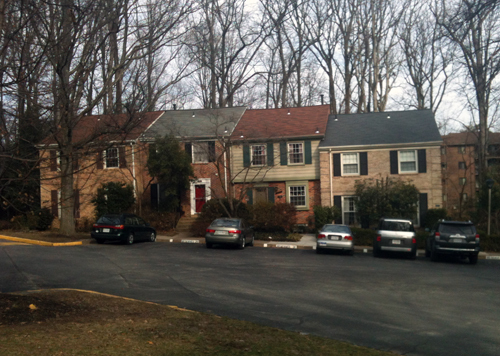 These colonial style townhomes have brick exteriors, shuttered windows, and two designated parking spaces. With three bedrooms and full basements, each home offers plenty of space for growing families and empty-nesters alike. And like most Reston homes built in the 1970's, each has beautiful hardwood floors and large windows. This quiet neighborhood sits right of Moorings and North Shore Drive, just a five minute walk to Lake Anne and a five minute drive to the new Reston Metro station. Although not on Lake Anne, the Cluster offers easy access to the Reston Association pathway that circles Lake Anne, making walks around the picturesque lake easy. Children attend Forrest Edge Elementary, Langston Hughes Middle School, and South Lakes High School. The North Shore Pool is an easy walk across Lake Anne Plaza, and the sprinkler park is practically in the neighborhood's backyard. Click here to find listings in Chatham Colony Cluster and the Lake Anne area of Reston. Links Pond Cluster in South Reston feels like a little touch of country in the heart of Reston. The 67-home neighborhood borders Reston National Golf Course, and features the pond for which the cluster is named. It's a common sight in the summer to see people spending lazy days fishing in the pond. This cozy neighborhood feels remote, but is actually in the heart of all Reston has to offer. Developed in 1974, the Links Pond community features 3-level, 4-bedroom brick and siding townhouses. Each home has one assigned parking space, with plenty of additional parking on South Lakes Drive. This is a great community for young families. The schools--Terraset Elementary, Langston Hughes, and South Lakes High School--are all close. With easy access to the Reston Association paths, it's easy to get out for a run or walk. Links Pond is close to both South Lakes Village Center and Hunters Woods Village Center, home to the Reston Community Center. Residents also have easy access to the Toll Road and the Wiehle metro. As with every cluster that is part of Reston Association, Links Pond residents have access to the RA pools and tennis courts--nearby Glade pool with its waterslide is a favorite for kids! Find listings for Links Pond and South Reston here. Bet that title made you think of green buildings, green living, green space--or really any way you can live a more environmentally sustainable life in Reston. But it's not. After all, it's March! So I'm wondering how green you get on March 17. St. Patrick's Day Reston 2014 is your chance to show your green. Everyone is a little Irish on St. Patrick's day. Donning shamrocks and eating corned beef is fun! Reston provides plenty of opportunities for you to show the world just how green you are. And since March 17 is a Monday this year, there will be plenty of celebrating happening all weekend. Here is my run down of ways to celebrate St. Patrick's Day Reston 2014, with a little something for everyone. What better way to get into the spirit of St. Patrick's Day than listening to one of the finest traditional Irish instrumental bands touring today? Lunasa is a funny, talented, and delightful group of Irishmen that has celebrated St. Patrick's Day with Restonians for more than 20 years. If you've never seen or heard them, don't miss this opportunity. These concerts usually sell out, so get your tickets now! Enjoy St. Patrick's Day at Reston Town Center Saturday March 15 all day! Clyde's will kick off St. Patty's day with delicious Irish fare beginning at 9--is anything better than Irish breakfast? You can also have a Guinness, listen to Irish music and enjoy Irish folk dancing. This is a family event, so there will plenty of children's activities, including a moon bounce and face painting, all day long. 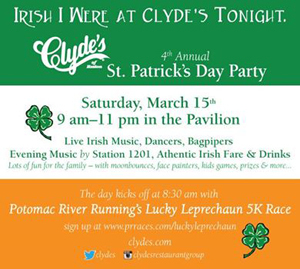 Potomac River Running's Lucky Leprechaun 5k. http://www.prraces.com/luckyleprechaun/ WHEN: March 15, 2014 - 8:30 a.m. WHERE: Reston Town Center, 11911 Democracy Dr., Reston, Va.
Before you hit the Clyde's party, put on your best Leprechaun gear and chase the rainbow in this fun 5k race that ends at Clyde's. You may not catch the pot of gold, but you'll certainly deserve the treats that await you at the end of the run. Join the quarterly Reston Community Center and Reston Association social event to celebrate St. Patrick's Day--as if Reston seniors need a reason for a party. Spend the afternoon with friends while enjoying traditional Irish fare and beautiful Irish music and entertainment. Registration required. Contact Ashleigh@reston.org or call 703-435-6577 to register. Washington, DC St. Patrick's Day Parade 2014 March 16, 2014. Noon to 3:00 p.m. Okay, so heading into DC for the annual St. Patrick's Day parade does mean leaving Reston. Trust me, it's worth it. This parade is always fun and entertaining. Until our own metro station opens, you still need to head to Vienna or Falls Church, but this will be the last year for that! The parade goes along Constitution Avenue -- 7th to 17th Streets NW. This two-and-a-half hour special event includes floats, marching bands, pipe bands, military, police, and fire departments. Look for fun stuff happening at the various Irish pubs in the neighborhood tool. This is a fun family day for those who didn't get enough at Clyde's. Whatever you choose to do, have fun and be responsible! Happy St. Patrick's day!